Lake Salem Cottages are four family owned cottages located on a sandy beach, each with at least a 100 foot private frontage on Lake Salem near the Canadian border in Derby, Vermont. 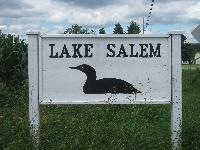 They are located on a peninsular of land separating Big Salem Lake from Little Salem Lake. Cottagers enjoy unique access to both lakes, which are excellent for fishing, with plentiful bass, walleye, and salmon. Each cottage has its own dock and 12' aluminum boat which can be used with a small out board motor. Many of our cottagers have been coming to Lake Salem for years. The most fun is being on the beach where the lake is quite shallow for about 50 feet so children are safe to play. The beach has been and is the site of numerous family summer "olympic games", cookouts, sand castles, and star and northern lights gazing at night. There is a sand bar at one end of the beach and the Clyde River connects the two lakes. The sand bar is a favorite place to play and share with the ducks, herons and other birds that land there. Lake Salem Cottages is a family run business which is mainly a labor of love. The cottages have been in the Ainsboro and Newell families for over ninety years. The new generation of Pages and Roehners are operating them now, hopefully respecting the special characteristics that make families come back year after year, with appropriate upgrading to make the experience a continuing pleasant one. The Northeast Kingdom is one of Vermont’s hidden treasures. The area has been called the Switzerland of Vermont due to the presence of such beautiful mountains like Jay Peak, Burke, and Owls Head which in the Winter turn into ski areas. The presence of numerous lakes such as Mephramagog, Seymour, Willoughby, Caspian, and Echo in addition to Lake Salem add to the beauty of the area. Montreal lies less than two hours away for a day of international food and tourism. The area has several championship level golf courses, tennis courts are available, and the fishing at Lake Salem is renowned as the state of Vermont stocks the lake. Hiking trails abound as the Northern spur of the Appalachian Trail passes close by. The best time is spent right at the lake relaxing, swimming, reading a book, doing a puzzle, fishing, enjoying a sreened porch, and generally getting away from it all. Because the cottages are all in a row (although very private), they are ideal for sharing a vacation with another family in a neighboring cottage. We try to accommodate such groups to the extent that we can. A great joy for us is to watch the children come back year after year and grow up at Lake Salem the way we did when we were kids.